“See What You Missed” video is here. Enjoy and stay tuned for “One to One interviews." Watch, enjoy and see why you should have been there. "A toast to the founders of WMC -- these 3 goddesses who have been raising hell through raising consciousness." 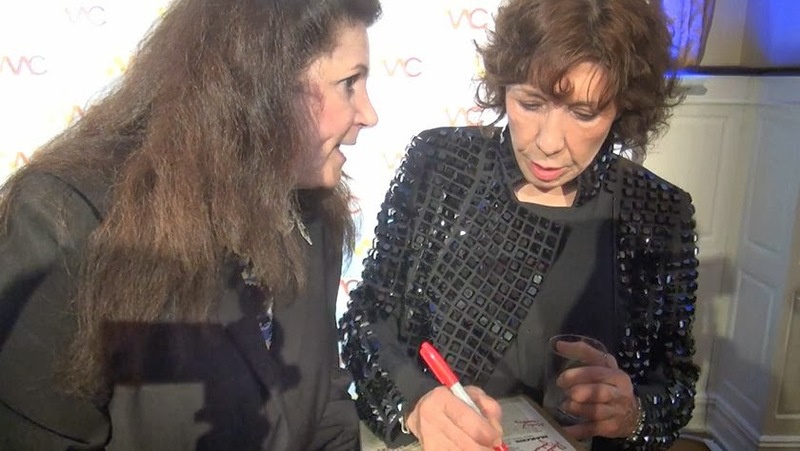 ~~ Lily Tomlin , host of the Women’s Media Center 2013 Women’s Media Awards font> , American actress, comedian, writer, and producer and major force in American comedy, on WMC Co-founders -- Gloria Steinem, Jane Fonda and Robin Morgan -- as quoted during the WMC Women's Media Awards gala at 853 Park Avenue in New York City, October 8, 2013. Photos above left, and to the right of Lily Tomlin by Gloria Buono-Daly. On Tuesday, October 8, 2013, celebrities, personalities, feminists, artists, business and media leaders gathered for The Women’s Media Center 2013 Women’s Media Awards hosted by Lily Tomlin – Tony, Grammy and Emmy® Award-winning actress, comedian, writer, and producer and major force in American comedy since the 1960s. 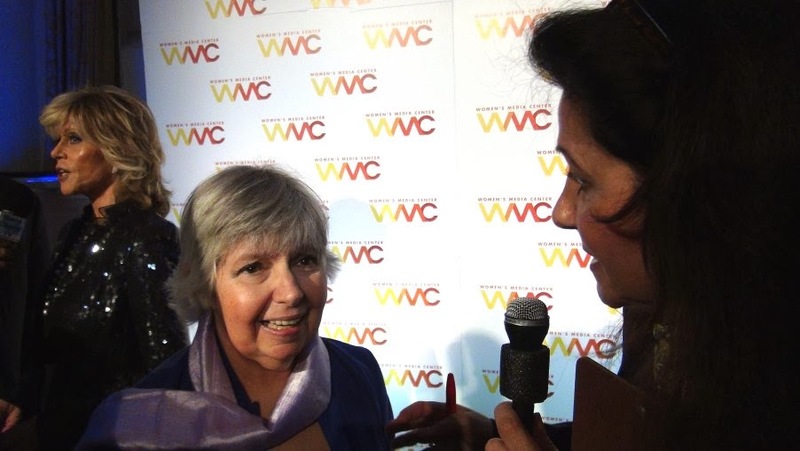 Photo below right of WMC 2013 Carol Jenkins Emerging Journalist Award recipient, Maria Teresa Kumar by Gloria Buono-Daly. 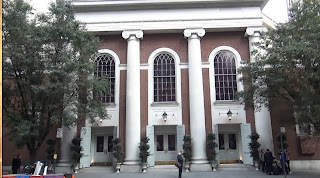 Co-founders Gloria Steinem, Jane Fonda and Robin Morgan were among the presenters. ♦ Maria Teresa Kumar - Carol Jenkins Emerging Journalist Award. 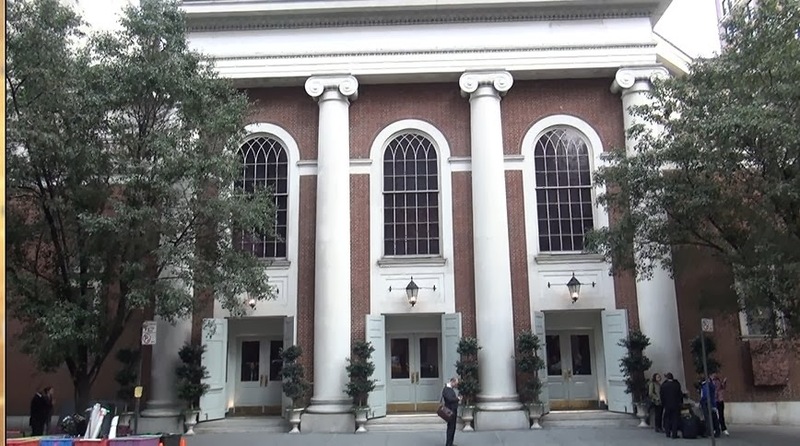 The full house event held at 583 Park Avenue, a spectacular venue on 63rd and Park Avenue in New York City is charmed with magnificent motifs and architecture reminiscent of the bygone era. 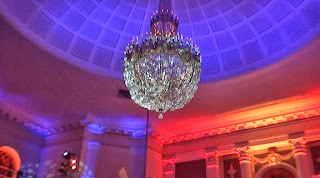 Photos above left, exterior 583 Park Avenue and below right crystal chandelier adorns the dinner reception hall by Gloria Buono-Daly. This event marks the 5th annual awards celebration which recognizes individuals who have made outstanding contributions to advancing women’s and girls’ visibility and power in media. 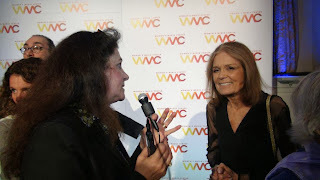 The WMC 2013 Women's Media Awards event is co-chaired by Jane Fonda, Robin Morgan, Gloria Steinem, Gayle King, Loreen Arbus, Pat Mitchell, Martha Nelson, Carol Jenkins, Jewelle Bickford, Lauren Embrey, Jodie Evans and Gloria Feldt. Photo below left of Jane Fonda by Gloria Buono-Daly. Jane Fonda presented the Social Media Award to 31 year old, Lindy West, writer at Jezebel. The honoree was selected online by twelve distinguished digital journalists, bloggers, and thought leaders. "Social media has brought news and differing perspectives to the world and changed the conversation...It is where the power to make significant change exists today," said Fonda. The Women’s Media Center 2013 Awards represent a powerful, influential, emerging, and engaging media force. Many more photos posted at Facebook album titled The Women's Media 2013 Women's Media Awards. Photo right Gloria Steinem by Gloria Buono-Daly. Photo left of WMC 2013 Visionary Role Model and Corporate Leadership Award recipient, Sheila C. Johnson by Gloria Buono-Daly. 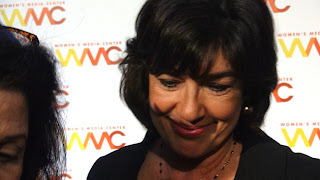 Photo right of WMC 2013 Pat Mitchell Life Time Achievement Award recipient, Christiane Amanpour by Gloria Buono-Daly. Photo below left of Robin Morgan by Gloria Buono-Daly. This article will be updated regularly with photos, videos of interviews and other related information. Please visit frequently and subscribe to our RSS feed. Thanks. Very exciting, this year to have the opportunity to interview Co-Founders Jane Fonda, Gloria Steinem and Robin Morgan, host Lily Tomlin as well as all 3 honorees -- Christiane Amanpour, Sheila Johnson and Maria Teresa Kumar along with many other special guests including Tamsen Fadal, Stacey Tisdale, Kathleen Turner, etc. It's all things red carpet excitement and media extravaganza tonight as The Women’s Media Center celebrates honorees of The Women’s Media Center 2013 Awards. The Women's Media Awards 2013 for Social Media was also announced. • Gayle King, Co-Anchor of CBS This Morning and an editor-at-large for O Magazine. Co-Chair of the Women’s Media Awards. • Sally Field, two time Academy Award-winning actress, producer, director, and screenwriter. • Kathleen Turner, Golden Globe-winning actress. • Kathy Najimy, actress and comedian. • Julie Burton, President of The Women’s Media Center. • Pat Mitchell, President & CEO of The Paley Center for Media, Founding Co-Chair of The Women's Media Center, former Women’s Media Award Honoree. Co-Chair of the Women’s Media Awards. • Loreen Arbus, First woman to head up programming at a major U.S. network, disability rights activist/producer/Founder & Chair of Women Who Care. Co-Chair of the Women’s Media Awards. • Martha Nelson, Editor-in-Chief of Time Inc., former Women’s Media Award Honoree. Co-Chair of the Women’s Media Awards. • Carol Jenkins, author, former WNBC Anchor, former and Founding President of The Women’s Media Center, contributing writer for The Huffington Post, Board Member of The Women’s Media Center. Co-Chair of the Women’s Media Awards. • Jewelle Bickford, Partner and Wealth Adviser at Evercore Wealth Management, Board Member of The Women’s Media Center. Co-Chair of the Women’s Media Awards. • Lauren Embrey, President and CEO of the Embrey Family Foundation and CEO of Embrey Interests, Ltd.; Board Chair of The Women’s Media Center. Co-Chair of the Women’s Media Awards. • Jodie Evans, Co-Founder of CODEPINK/Peace, environmentalist, women's rights & social justice activist, Board Member of The Women’s Media Center. Co-Chair of the Women’s Media Awards. • Gloria Feldt, The New York Times best-selling author, speaker, commentator, and feminist leader. Co Founder and President of Take The Lead. Co-Chair of the Women’s Media Awards. • Tamsen Fadal, Emmy Award-winning Anchor, WPIX Television News. • Tim Morehouse, U.S. Olympic Silver Medalist & E! News Correspondent. • Rachael Kun Morehouse, Emmy-winning Associate Producer, 60 Minutes. • Blake Morgan, musician, singer-songwriter, music producer, and CEO of ECR Music Group. • Patricia Bosworth, noted journalist, biographer and contributing edtior, Vanity Fair. • Francine LeFrak, award-winning theatrical, television and film producer; entrepreneur and philanthropist. • Jane Wagner, Emmy Award-winning writer, director and producer. • Lori Sokol, Founder & Publisher, Sokol Media Inc.; contributing writer for The Huffington Post; and Board Chair, Women’s eNews. • Suzanne Braun Levine, author and editor. First female Editor of the Columbia Journalism Review and the first Editor of Ms. Magazine. • Maya Harris, Vice President for Democracy, Rights and Justice at the Ford Foundation. • Geneva Overholser, Professor and former Director of the School of Journalism at the University of Southern California's Annenberg School for Communication and Journalism. Yay, the photos of The Women's Media Center 2013 Women's Media Awards are posted on Facebook and we hope to have videos in record-breaking time. Gloria Buono-Daly photos on Facebook from last year’s event; will be updated with tonight’s photos soon.